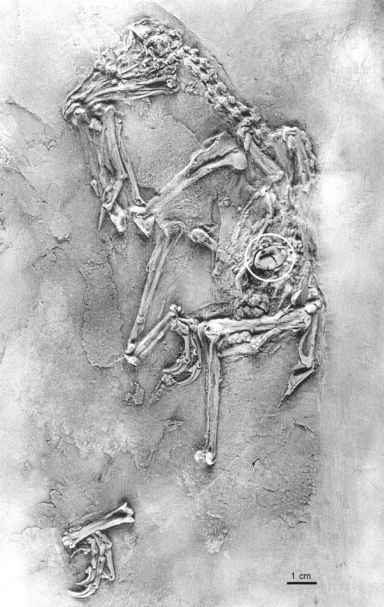 Masillaraptor parvunguis Mayr, 2006 is known from two largely complete but poorly preserved skeletons from Messel (Fig. 14.2; Mayr 2006e). This species was considered to be possibly related to the falconid Polyborinae by Peters (1988a, Fig. 2; see also Peters 1991). Its long beak has an equal depth over most of its length and a straight culmen, which curves just before the tip. The legs are likewise quite long and the ungual pedal phalanges rather weak. As in the Falconidae, Sagittariidae, Pandionidae, and Accipitridae the two central phalanges of the fourth toe are abbreviated. In further concordance with the Pandionidae, Accipitridae, and Falconidae, the first phalanx of the second toe is shortened. Nevertheless, the phylogenetic affinities of M. parvunguis are difficult to establish because of the poor preservation of the fossil specimens and the unresolved relationships of extant raptorial birds. 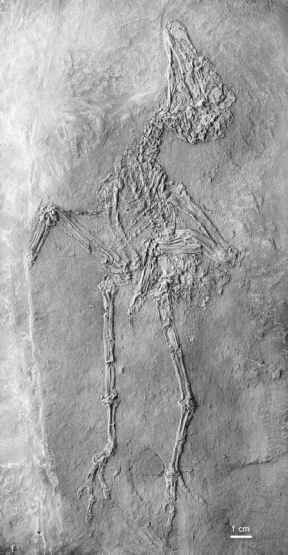 Its tentative assignment to the "Falconiformes" was based on the presence of a raptor-like beak and abbreviated pedal phalanges. Mayr (2006e) assumed that M. parvunguis is closely related to Coturnipes cooperi Harrison and Walker, 1977 from the London Clay. The original description of this species was based on a distal tarsometatarsus, but Olson (1999a) reported fragmentary remains of similar birds from the early Eocene Nanjemoy Formation of Virginia, and mentioned a specimen of C. cooperi from the London Clay of Walton-on-the-Naze in the collection of Michael Daniels. I have also examined this latter specimen, and as already noted by Olson (1999a) the wing bones are reminiscent of those of the Falconidae, whereas the leg bones exhibit a quite generalized morphology unlike that of diurnal birds of prey. A tarsometatarsus from the Geisel Valley was tentatively assigned to C. cooperi by Mayr (2002a).